If your non-profit workplace has a 403(b) plan for employees, you may be asked to serve on the committee. In this case you need to learn about how these plans work, what they do, and the nature of your role as a committee member. In this post, we will explain the basics so you will have a better understanding of your responsibilities. First, let’s briefly review the 403(b) retirement plan. If you are not familiar with how these plans work, they are the non-profit version for organizations like schools, charities, cultural centers, research institutions, and other entities exempt from paying taxes under Section 501(c)(3). One of the primary responsibilities of committee members is to select appropriate investment options that will be made available to employees. The committee members have an obligation to act in the best interest of the participants as laid out by ERISA regulations of fiduciary responsibility. Additionally, the committee should create and follow a written document, or set of documents, that lays out some of the details of the plan as stated in the Investment Policy Statement (IPS). Within an IPS, a few key elements should be present. First, it should contain the details of the available investment choices for plan participants. Next, it should describe the roles and responsibilities of the committee members. Also, the document should specify when an investment should be placed on the watch list, remove list, and further include acceptable standards to keep as an investment option for plan participants. Additionally, the retirement plan committee should address employer matching contributions. For example, the organization has to decide whether it will match employee contributions to the plan, and if so, how much. This decision that should involve the finance department within your organization. As a member, you will be asked to participate in reoccurring committee meetings. While there is not an exact rule stating how often these meetings take place, a common choice for an established organization is one meeting per quarter. During a meeting, the committee should discuss important matters such as the performance of the investments in the plan and whether the current fee structure is reasonable. At these meetings, you should be present and an active participant. It is considered best practice to record meeting minutes and document discussions pertaining to the plan. 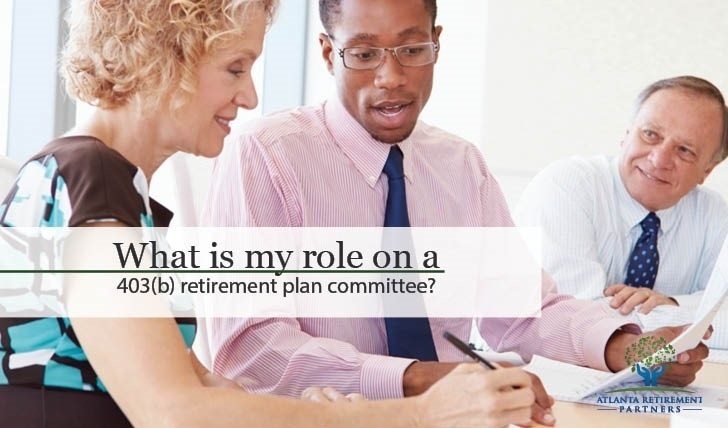 Keep in mind that as a committee member, you are representing the interests of the employees and determining what is appropriate to include in the organization’s retirement plan. Every couple of years, it is prudent to occasionally shop for alternatives retirement plan providers. This way, you can be sure that the retirement plan platform is competitive and being offered at a reasonable cost. By now, you should know a good deal about what you need to do if called upon to be one of the members of the overseeing committee. You will want to try to do your best for the employees who invest in the plan. Remember, the majority of Americans rely on company-sponsored retirement plans as their primary accumulation vehicle for the golden years. Your actions directly impact future savings. We thank you for taking on this noble responsibility.